Click above for a printable coupon. Print one coupon for each person attending and bring to the Expo to save. Click above for a printable coupon ($3.50 Admission). 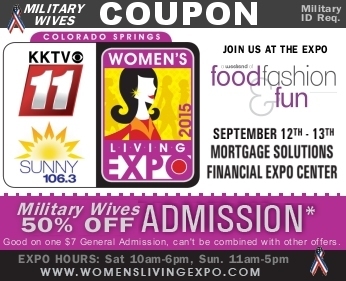 Print one coupon for each military wife attending and bring to the Expo to save 50% on General Admission Tickets. Good for one day, Saturday or Sunday. Free Parking, chidren under 8 are free. Combination Expo and Cooking Class Tickets! Choose a class time, or an All Day pass!